From Christina: Saint Patrick’s Day is just around the corner. Usually I fix the traditional corned beef and cabbage meal…but this year, I wanted to be a little different. Fortunately, author Tricia Andersen stepped in to offer her recipe for Irish Beef Stew. This is what we’ll be having on the 17th! I wanted to share it here a few days ahead of the holiday so that you’ll have time to do a bit of grocery shopping too if you’d like to serve this for your family and friends. Since both my husband and I are both part Irish, St. Patrick’s Day is a huge deal in our house. I get a little crazy and try to make a special dinner for my family. 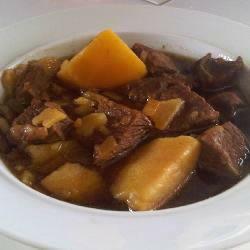 A couple of years ago I found this Irish Beef Stew Recipe on AllRecipes.com. I hope it’s a hit with your family like it is with mine! Quick note from Christina: The recipe calls for stout beer. Since no one in our family imbibes, I’m planning to substitute beef broth with maybe a pinch of ginger and/or Worcestershire sauce. Below the recipe I’ve included an “alcohol substitution” link. Heat the oil in a large skillet over medium heat. Toss beef cubes with flour to coat, then fry in the hot oil until browned. Place the carrots, potatoes, onion and garlic in a large slow cooker. Place the meat on top of the vegetables. Mix together the beef broth and tomato paste and pour into the slow cooker along with the beer. Cover and cook on High for 6 hours or Low for 8 hours. During the last hour before serving, dissolve the cornstarch in cold water and then stir into the broth. Simmer on the High setting for a few minutes to thicken.